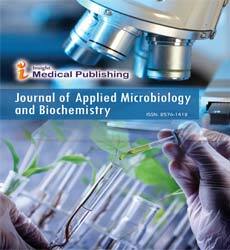 Journal of Applied Microbiology and Biochemistry is a peer reviewed journal that focusses on publication of manuscripts pertaining to the application of micro-organisms in industrial and molecular microbiology. The microbiological principles are exploited in the fields of food microbiology, environmental biotechnology, medical microbiology and industrial biotechnology for the development of commercially important process and products such as antibiotics, commercially relevant enzymes and proteins, vitamins, amino acids, etc. The journal also publishes research developments related to biochemical engineering, biochemical pharmacology and diagnostics. The principles of biochemistry are applied for the development of advanced diagnostic tools like Ames test, pregnancy test kits and PKU test for phenylketonuria diagnosis as well as in treatment of diseases. The aim and scope of this Journal is to produce high quality articles on related aspects of Microbiology and Biochemistry. The journal accepts manuscripts in the form of original research article, review article, short communication, case report, letter-to-the-Editor and Editorials for publication in an open access platform. All the articles published in the journal can be accessed online without any subscription charges and will receive the benefit of extensive worldwide visibility. Applied Microbiology and Biochemistry follows single blind peer review process for validating the quality and worth of each received manuscript. Review process is performed under the aegis of the Editorial Board and after primary quality check each article is reviewed by the outside experts under the guidance of the assigned Editor. At least two independent reviewers approval followed by Editor Approval is mandatory for acceptance of any submission. Processing of the articles will be done through the Editorial Manager System for hassle free operation by the authors and the publisher. Infectious disease, also known as communicable disease is illness resulting from an infection. Infection is the invasion of an organism's body tissues by disease-causing agents, their multiplication, and the reaction of host tissues to these organisms and the toxins they produce. They are caused by infectious agents including viruses, viroids, prions, bacteria, nematodes such as parasitic round worms and pinworms, arthropods such as ticks, mites, fleas, and lice, fungi such as ringworm, and other macro parasites such as tapeworms and other helminths. Molecular Biology is an interdisciplinary field of science that deals with the fields of chemistry, structure and biology as it seeks to understand life and cellular processes at the molecular level. It mainly focuses on the determination of cell fate and differentiation, growth regulation of cell, Cell adhesion and movement, Intracellular trafficking. The relationship of signalling to cellular growth and death, transcriptional regulation, mitosis, cellular differentiation and organogenesis, cell adhesion. Molecular biology explores cells, their characteristics, parts, and chemical processes, and pays special attention to how molecules control a cell’s activities and growth. To understand the behaviour of cells, it is important to add to the molecular level of description an understanding on the level of systems biology. Applied Biochemistry is the part of biochemistry where knowledge and methods related to biochemistry are applied to real world problems like to investigate cause of diseases in medicine, to study effect of nutritional deficiencies, to find ways for pest control, improve productivity and storage in agriculture. A biomolecule is any molecule that is present in living organisms, including large macromolecules such as proteins, polysaccharides, lipids, and nucleic acids, as well as small molecules such as primary metabolites, secondary metabolites, and natural products. There are thousands of different types of molecules in a cell. A diverse range of biomolecules exist, including Small molecules Monomers, oligomers and polymers. Mycobacterial diseases are the bacterial diseases, caused by the member of Actinobacteria family. These mycobacterial diseases include tuberculosis, leprosy, Mycobacteria ulcer and Mycobacterium Para tuberculosis. Symptoms of diseases are fever, weight loss and fatigue. Few mycobacterial diseases are treated with antibiotics drugs like rifampin, ethambutol and isoniazid. Mycobacterial Diseases come in two forms: Contained form and the Aggressive form. People suffering from contained form of mycobacterial diseases develop only the Cell-mediated immunity. However, sufferers from aggressive form of disease mount up the humoral immune response to the infecting mycobacteria. Clinical microbiology is the study of micro-organisms that caused infections and diseases to Human and other animals. It is an adaptation of microbiological techniques to the study of etiological agents of infectious disease. It often deals with hospital-acquired and public-health problems that affect both hospital and community. It is related to the laboratory diagnosis of human and animal infections and the role of the laboratory in both the management of infectious diseases and the elucidation of the epidemiology of infections. The latest developments in clinical microbiology and immunology, providing the current state of knowledge in the field. Infections caused by disease causing bacteria or pathogenic bacteria termed as Bacterial Infection. Bacteria can be beneficial – for instance, gut bacteria help us to digest food – but some are responsible for a range of infections. Serious infections can be treated with antibiotics, which work by disrupting the bacterium’s metabolic processes, although antibiotic-resistant strains are starting to emerge. Fermentation Technology encompass a broad field, but within this profile we target the use of microorganisms and/or enzymes for production of compounds that find application in the energy, chemical, material, pharmaceutical and the food sector. Even though fermentation processes have been used for generations, the requirement for sustainable production of energy and materials is demanding innovation and development of novel fermentation concepts. Applied Microbiology deals with the study of Medical microbiology. The study of the pathogenic microbes and the role of microbes in human illness, Pharmaceutical microbiology the study of microorganisms that are related to the production of antibiotics, enzymes, vitamins and vaccines, Industrial microbiology the exploitation of microbes for use in industrial processes. Medical microbiology deals with response of immune system to the invading microorganism. It deals with conducting and interpreting tests for viral, fungal and parasitic infections and also with bacterial pathogenesis of humans.